IVAN SHISHKIN, RUSSIA'S "CZAR OF THE FOREST"
When it comes to landscape paintings, what immediately comes to mind is Claude Monet, one of the best among the French Impressionists. Likewise, others would be able to include the names of Alfred Sisley, who was a devotee of plein air painting and Camille Pissarro and one of the greatest landscape artists of all time, JMW Turner. Not many would be able to talk about an artist from Russia. However, Russia has some of the best naturalist and scenic painters in history. 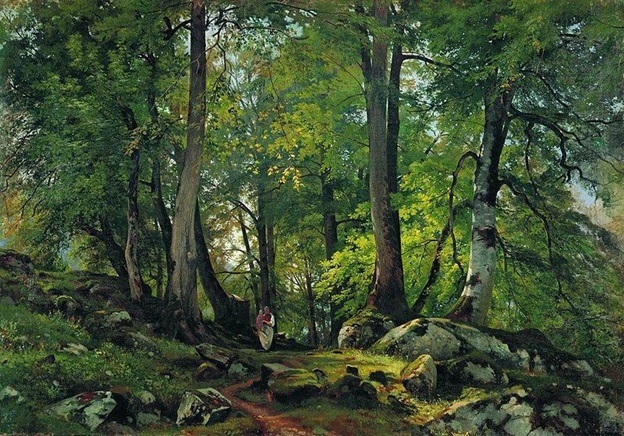 One of them was Ivan Shishkin, who was born on January 25, 1832. He specialized in woodlands and trees, earning him the nickname of “Czar of the Forest” for indeed he was able the capture the beauty, greatness and natural compositions of these natural objects, faithfully depicting its natural colors, and the way light playfully flit in the shade. It is completely breathtaking how he was able to capture the light, which transformed his paintings into simply marvelous works of art. He not only traveled extensively in Russia but also in other neighboring European countries. Some of the best examples of his works include the “Oak Grove” that looks like a snapshot taken with a modern day high-resolution camera, with the play of light and shade created by the branches and clumps of leaves among many of the trees and on the ground, makes you gape in awe. Ivan Shishkin showed his skills in drawing at a very young age and was said to be never apart from his pencil. He was born into a merchant family and his father was reluctant to have him enter an art school. At age 20 he was able to convince his father and enrolled in 1852 at the Moscow School of Painting and Sculpture. Now hailed a National Artist in his homeland, he graduated from the St. Petersburg Imperial Academy of Arts with a Gold Medal for his “View of Valaam Island, Kukko.” He was also awarded a three-year art scholarship and he traveled around Europe to study etching, lithography, painting and drawing mostly in Switzerland and Germany. Five years after his graduation, he became a professor of painting at his alma mater, where he taught art classes from 1873 to 1898. His unique and intricate painting style was attributed to his analytical studies of his natural surroundings. While he was popularly known for his forest landscapes, Shishkin was also a very proficient printmaker and draftsman. 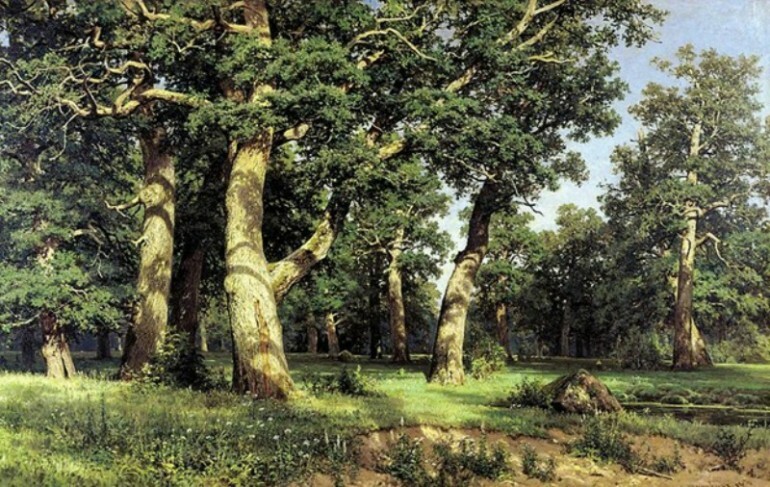 Some of Ivan Shishkin’s finest landscapes were painted in his dacha in Vyra, which was close to St. Petersburg. There he painted through all the seasons. Shishkin died in 1898. He was working on a new painting in St. Petersburg when he died. In 1978 Soviet astronomer Lyudmila Zhuravlyova discovered a minor planet, which was given the name 3558 Shishkin in his honor. During his career Shishkin was able to produce landscape paintings in the hundreds and thousands of studies and drawings. He also did quite a sizeable amount of engravings in his lifetime. Most of his works were bought by Pavel Tretyakov, a Russian art collector. Although he only concentrated on a few range of subjects for his landscapes, Shishkin was a very successful artist during his time and was esteemed highly in the 19th century as one of the greatest landscape painters in Russia. He did not put too much concern on interpretation, romanticism or narrative in his works. He painted what his trained eyes saw, thus the natural beauty of nature was forever captured on canvas. But it was relatively slow work because he was notoriously concerned about details, which was evidenced by the countless analytical studies he made prior to the actual painting. This trait, however, was what set him apart from his fellow Russian artists in the 19th century. Aside from painting, Shishkin was a drawing master. His drawings went through the same process as his paintings, which resulted in numerous studies. It was said that before Shishkin came into the art scene, no other artist was able to show the beauty of Russia’s countryside. Even fellow artist and mentor Ivan Kramskoy recognized his exceptional skill, saying that Ivan Shishkin was a “school by himself.” His charcoal and chalk drawings that he created late in his career where very expressive. His last completed painting was “Grove of Ship Timber” that he finished in 1898. It showed the grove of ship-building timber in Afonasov, which was near his birthplace, Yelabuga. Most of the artist’s works can be seen at the Russian Museum in St. Petersburg and at the Tretyakov Gallery in Moscow. There are also several that are in the bigger art galleries in the Ukraine.